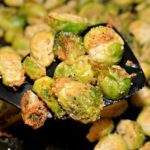 These flavorful Brussel Sprouts are quick to prepare, packed with flavor, and will change the way you think of these little green veggies! 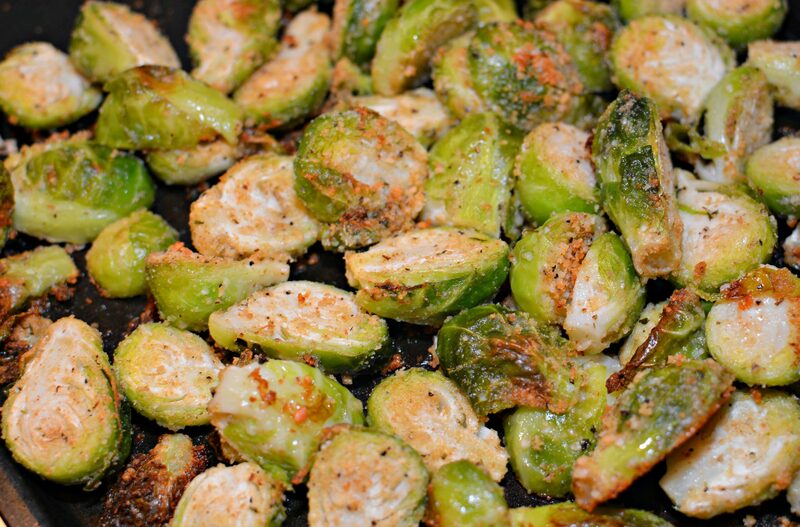 For most of my life, I adamantly refused to eat Brussel sprouts. I vaguely remember being a small kid and taking a tiny bite only to spit it out immediately in disgust. In my defense, I think I was only around eight or nine, haha! From that point on, I never tried them again. Fast forward to last year and my hubby and I were at a local brewery with some friends and everyone ordered a few appetizers. One of which was roasted Brussel sprouts. Now, theirs had some tasty sauce over it, but Brussel sprouts nonetheless. My plan was to avoid the dish entirely, until everyone started raving about how tasty they were. Curiosity got the best of me and I decided to try a bite. Let me tell you. That first bite changed the way I look at those little green veggies. No more looking at them in disgust, they are my new favorite veggie. Perhaps I matured since the age of eight or nine and green veggies are no longer banned from my plate. Now, my hubby and I have since tried several versions of Brussel sprouts trying to replicate the ones we had. The sauce was similar to a sriracha, had a kick to it, but a tad salty as well. We have yet to master that version, but along the way, came up with this one which is also a great option! We’ll keep trying combinations until we master the restaurants version, so stay tuned! I am a big fan of anything garlic and Parmesan. Combine the two and I am one happy gal. I have now made these as a side dish a few times and each time, my kids actually go back for seconds. Given the fact that they are only seven, nine, and eleven, I must admit I am quite impressed. My daughter says these are her favorite, even over corn, which for her, is a really big deal! Simply toss them in a bag with the ingredients listed, dump them onto a cookie sheet, and pop them into the oven. You have a simple, healthy, side dish that compliments any meal! I have even had them reheated the next day with lunch and they were just as yummy. That’s always a perk since reheating veggies can be hit or miss at times! If you try these, be sure to come on back and drop a comment below letting me know what you thought. 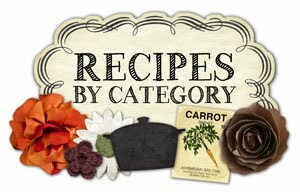 If you have a favorite version of these veggies, I would love to hear it! 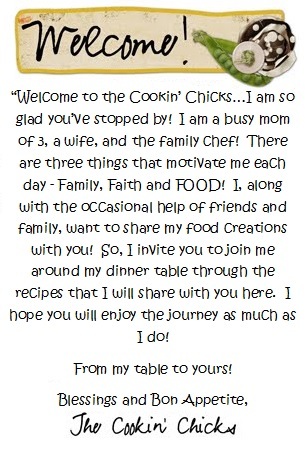 And lastly, if you use Instagram, I would love to see your creations, use #thecookinchicks and I’ll find ya! A quick, healty, flavorful dish that is quick to prepare and packed with flavor! Long gone are the days of avoiding these green veggies! Seconds anyone?!?! Preheat the oven to 425 degree (F) and lightly grease a baking sheet. 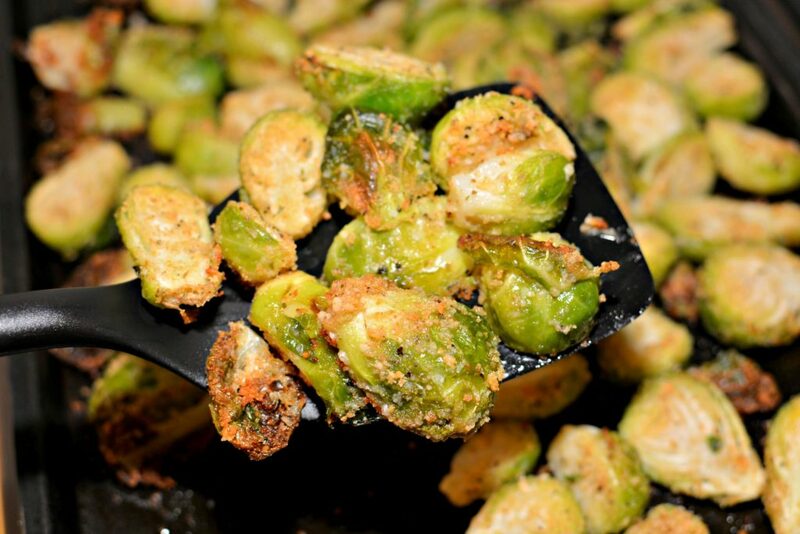 Place Brussel Sprouts into a gallon sized ziploc bag and add the olive oil, breadcrumbs, Parmesan, garlic salt, and pepper. Seal the bag closed and give it a good shake until all is evenly coated. Open bag and pour into an even layer on prepared baking sheet. Place baking sheet into oven and allow to cook for about 15-17 minutes, or until slightly golden brown. Remove from oven and serve! *Sprinkle additional Parmesan on top if desired. If you make them without the parmesan, they are FABULOUS cold! So glad to hear you enjoyed this!! Ooooo, sounds just as tasty! Never thought I would be saying that about Brussel Sprouts, hehe!